April 2010 issue on sale today! | What Hi-Fi? April 2010 issue on sale today! Of course, a 3D TV needs a 3D Blu-ray player to go with it and we've tested one of those too – Samsung's brand-new £349 BD-C6900. You won't be able to read about these two exclusive models anywhere else yet, so head on down to your local newsagent to find out just how this 3D TV and Blu-ray player perform. And if you're thinking of buying a new telly in 2010, 3D or not, then you simply can't afford to miss this month's feature on the Future of TV. It tells you everything you need to know about the latest models from all the major manufacturers, high definition, LED, internet connectivity, hard-disk video recording, Blu-ray and Freeview HD. Did we say Freeview HD? Oh yes, that's the other big technical breakthrough this year, with Freeview HD broadcasts already being transmitted in London, Liverpool and Manchester and rolling out across the rest of the country between now and 2012. In another exclusive First Test, we've put Britain's first Freeview HD set-top box – the £179 Humax HD-Fox T2 – through its paces. And for those who enjoy their music as much as their movies, we take a first look at Cambridge Audio's brand-new Azur 650BD universal Blu-ray player. 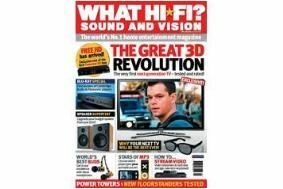 As if all that isn't exciting enough, there are Group Tests of budget stereo speakers starting from just £100 and Freesat receivers from £180, a roundup of video streamers and NAS devices, premium in-ear headphones, and the latest portable media players. Oh, and this month's Big Question is: "How much money should I spend on my Blu-ray player?" Three readers decide. Finally, we've got a trio of delectable hi-fi products in our Temptations section: a Classic valve amp from Quad, a minimalist turntable from Kuzma and a pair of supreme floorstanding speakers from PMC. And don't forget we're giving away a superb five-box Cambridge Audio/Q Acoustics hi-fi system in our April competition. This is one issue of What Hi-Fi? Sound and Vision you simply can't afford to miss.